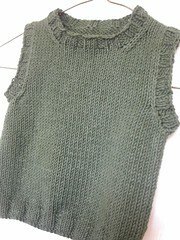 Well, the pattern’s called Bob and it’s for Dylan…….so here’s the simple vest for a little man’s first birthday. The pattern calls for mega-stripes but it’s a bit too much for my taste, so plain and simple it is. I had four balls available but almost used three for anyone’s reference.